WASHINGTON, N.J. -- A New Jersey high school football player died after suffering an injury on the field, school officials said Saturday. 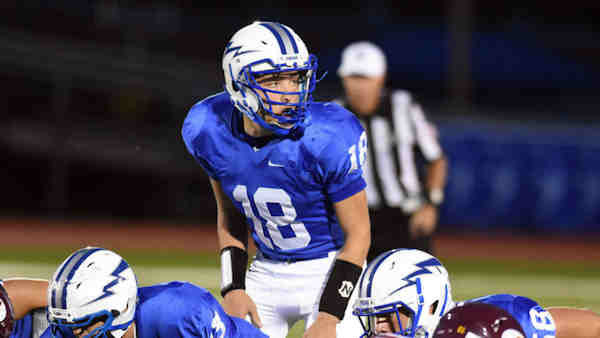 Warren Hills Regional High School quarterback Evan Murray died after being hurt in a game Friday night. A statement from interim Superintendent Gary Bowen said the school community is "deeply saddened" by the death of Murray, a three-sport athlete who had been the football team's starting quarterback for three years. Coaches, students and community members gathered at the school's football field on Saturday for a memorial. People who attended the game said Murray walked off the field under his own power after taking a hit in the backfield, then apparently collapsed a short time later. Bowen declined to take questions from reporters, saying a cause of death has not yet been determined. Authorities said an autopsy was planned for Saturday afternoon. Members of the school community said they were shocked by Murray's death. "I can't comprehend what happened," said one parent. A gofundme.com page has already been set up. It says Murray took a hit during the game that sent him to the hospital immediately. "Evan was always doing something to give back to his community. Please help us while we help the Murray family in their time of need. Donating anything with help!" it says. Our deepest condolences go out to the family and friends of Evan Murray. On behalf of all the people of New Jersey, Mary Pat and I send our heartfelt thoughts and prayers to the Murray family on the loss of Evan.